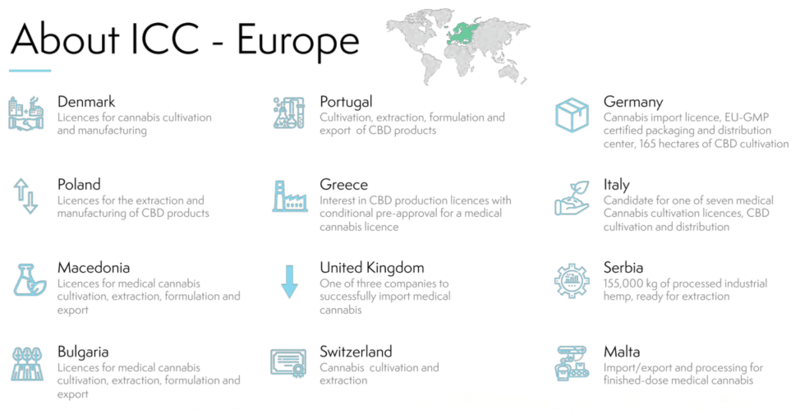 THINK GLOBAL, NOT LOCAL – Cannabis Markets Now Reaching Out to Europe! It’s unfortunate, but true: most investors only take a stake in their home country’s economy, which is a grave error because a truly diversified portfolio is international in scope. This is especially true for cannabis company investors, where people tend to over-concentrate on North America. If you’re looking into cannabis stock investing, you really need to think outside of the box and diversify geographically as much as possible. But on the other hand, that’s not so easy to do, as the vast majority of cannabis companies focus their operations in the United States and Canada to the exclusion of international markets. It’s actually very easy to get that type of international cannabis market exposure, though, since there is a company with connections and operations in multiple world continents. The name of the company is ICC International Cannabis Corp. (CSE: WRLD.U, OTC: WLDCF), and they’re the absolute leader in acquiring and operating top-tier international cannabis assets. There’s exciting news afoot for ICC, as the announcement was just released that they’ll be acquiring 49.9% of Wayland Group’s international assets. According to their agreement, Wayland will be supplying ICC with 10,000 kilograms of EU-GMP certified product per year over a three-year period, for a total of 30,000 kilograms. Europe is the perfect target for operations in legalized cannabis, as it literally has twice the population of North America, and Europe’s cannabis market is less developed and therefore less saturated with competition than the U.S. and Canada. What International Cannabis Corp. is doing with the Wayland Group joint venture is reaffirming the company’s commitment to broad and global cannabis market expansion. They’re consistent first-movers and early adopters in countries where other companies simply don’t have the connections or licenses to operate. But it’s the news of the Wayland acquisition that’s turning heads throughout the cannabis industry, as the numbers are truly impressive. 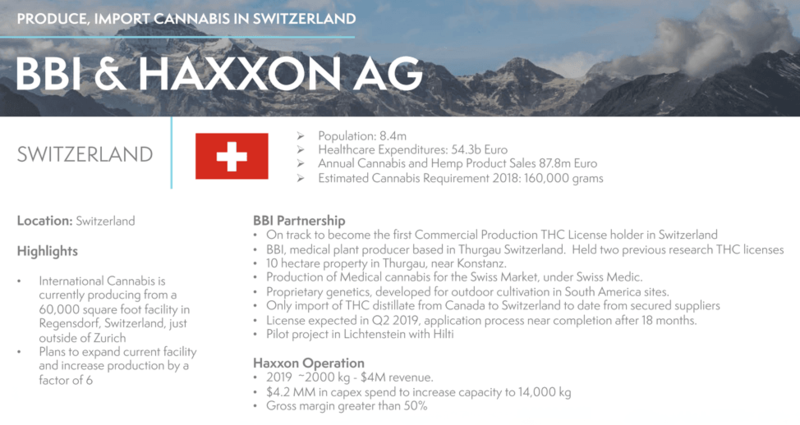 The agreement will provide International Cannabis Corp. with distribution and/or supply agreements with over 60,000 corporate and independent pharmacies, as well as an incredible 820,000 square feet of EU-GMP certified clean room cultivation space. Additionally, the Wayland deal will grant ICC licenses in 12 countries across 4 continents, 740,000 kilograms of dried cannabis production from outdoor cultivation, over 2,700 laboratory-tested craft cannabis strains, and over 125,000 kilograms of hemp biomass for processing. With this latest news release, International Cannabis Corp. is now part of Europe’s biggest growth industry phenomenon. We’re giving our strongest buy recommendation to WRLD.U/WLDCF shares for exposure to the rapidly expanding legalized cannabis market – in Europe and around the world. This work is based on SEC filings, current events, interviews, corporate press releases and what we’ve learned as financial journalists. It may contain errors and you shouldn’t make any investment decision based solely on what you read here. It’s your money and your responsibility. Wealth Research Group stock profiles are intended to be stock ideas, NOT advice. The ideas we present are high risk and you can lose your entire investment, we are not stock pickers, market timers, investment advisers, and you should not base any investment decision off our website, emails, videos, or anything we publish. Please do your own research before investing. It is crucial that you at least look at current SEC filings and read the latest press releases. Information contained in this profile was extracted from current documents filed with the SEC, the company web site and other publicly available sources deemed reliable. Never base any investment decision from information contained in our website or emails or any or our publications. Our report is not intended to be, nor should it be construed as an offer to buy or sell, or a solicitation of an offer to buy or sell securities, or as a recommendation to purchase anything. Wallace Hill Partners LTD owned by the same members who own Wealth Research Group, have entered into a three year agreement with International Cannabis, purchased shares, and have received three hundred thousand dollars. The information herein is not intended to be personal legal or investment advice and may not be appropriate or applicable for all readers. If personal advice is needed, the services of a qualified legal, investment or tax professional should be sought. LOOK NO FURTHER: This News Release Will Set the Stage for Mega-Profits!